Winter is coming! Which means: time to cosy up in puffer coats and knitted trousers. What's tricky during winter is that you never quite know what the weather will be like. If you live in Belgium you'll know what I mean, it's a constant play between sunshine - rain - snow (if my prayer's will be heard) and lots of wind. This can affect the choice of shoes you'll be wearing. Found these suede adidas kicks and immediately heard a tiny little mom-voice in the back of my head saying 'these will get dirty are you sure you'll wear them?'. I have been wearing them quite often, although I always did my weather-research up front and got quite lucky. 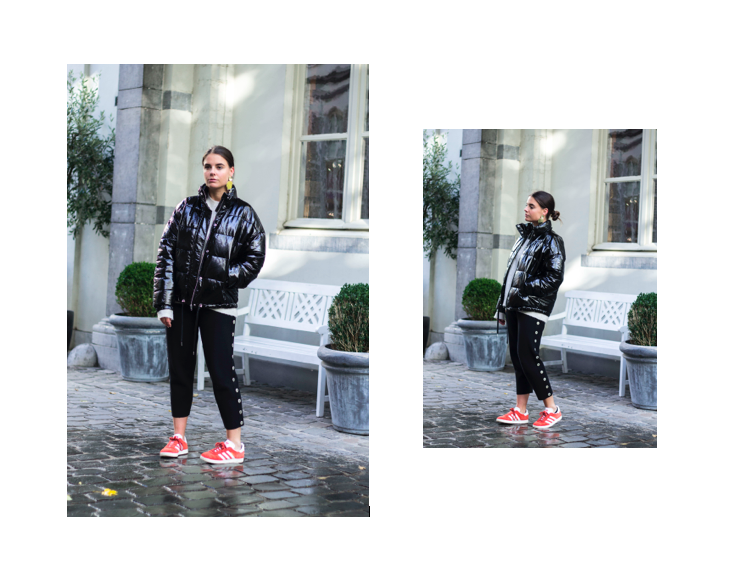 (Here are some tips for my dutch speaking readers) I teamed them with my favourite puffer coat at the moment (yes it's vinyl) and a pair of knitted trousers.